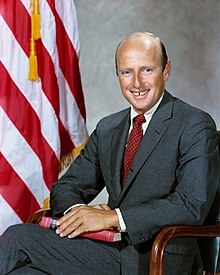 Charles "Pete" Conrad, Jr. (June 2, 1930 – July 8, 1999) was an American test pilot, aeronautical engineer and astronaut. During the Apollo 12 flight he became the third man to walk on the Moon. On August 21, 1965, Conrad flew into space as pilot of Gemini 5. This was the third trip by astronauts in NASA's Project Gemini. The trip lasted until August 29, 1965. Conrad made another spaceflight as command pilot (pilot in charge) of Gemini 11. This was the ninth trip by astronauts in Project Gemini. The trip lasted from September 12, 1966 to September 15, 1966. Conrad made his third space flight as spacecraft commander (person in charge) of Apollo 12. This was the second trip to land astronauts on the moon. The trip lasted from November 14, 1969 to November 24, 1969. Conrad flew in space for the fourth time as commander of the Skylab 2 flight. This was the first flight to take astronauts to Skylab, the first space station sent into space by the United States. The trip lasted from May 25, 1973 to June 22, 1973. Conrad died in a motorcycle crash in Ojai, California on July 8, 1999. ↑ "Astronaut Bio: Charles Conrad, Jr". NASA. Retrieved July 27, 2015. This page was last changed on 31 August 2017, at 09:43.